Specs: User Weight Rating: 250 lbs. (114kg) Stiffness Categories: 11-13 Build Height (average): 5.5 inches Connector: Integral male pyramid Warranty: 12 months Production Lead Time: 7-10 business days Please note, this product is made to order and non-returnable. Sizing is customizable - if the size you need is not listed below, please contact us. Specs: Sizes: 22-28cm (Sandal toe available) User Weight Rating: 255 lbs. 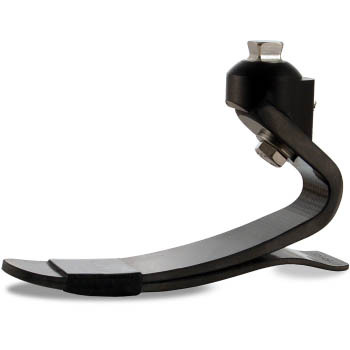 (116kg) Stiffness Categories: 1-6 Build Height (average): 3 inches Connector: Integral male pyramid Heel Height: 3/8″ (10 mm) Warranty: Foot module 36 months; Ankle 18 months This foot is eligible for a trial period - please contact us for more information about trials. 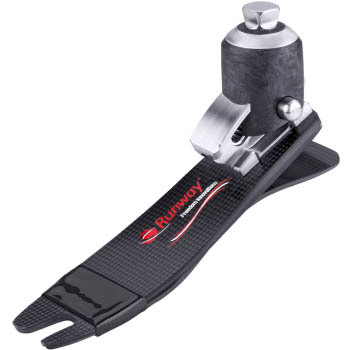 World’s First Load-Activated Foot Introducing the world’s first load-activated carbon fiber prosthetic foot designed to accommodate added weight when lifting or carrying heavy objects. 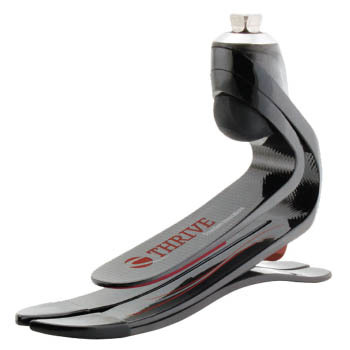 THRIVE provides support for variable weight when it’s needed – resulting in a dynamic foot that feels the same regardless of load. Overview: Dual-Keel Design THRIVE utilizes a synergistic, dual-keel design incorporating a full-length primary keel and a secondary, load-activated keel. 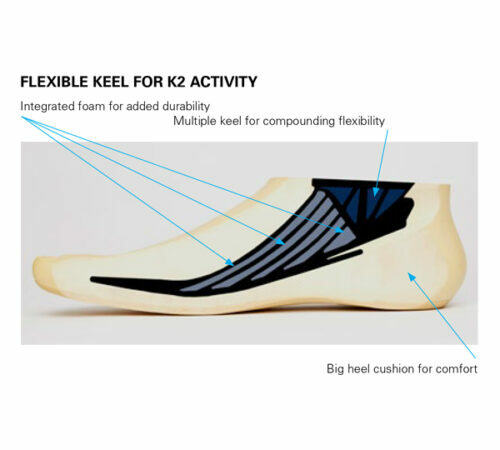 When an additional load (up to 30% of the user’s body weight) is sensed, THRIVE’s primary keel progressively comes into contact with the upper keel, providing incremental support. This ensures consistent performance, and ultimately greater confidence among users. Self-Activating Response to Varied Loads Users are free to carry on with their activities with confidence and without a second thought. Advanced Shock Absorption 11 mm of shock absorption increases comfort and residual limb health by managing forces that would otherwise be directed to the socket and knee joint. Exceptional Ground Compliance Split toe construction with /-15 degrees of inversion and eversion creates multi-axial ground compliance to provide dynamic control and stability on irregular surfaces. Outstanding Durability and Reliability Strong, carbon fibre construction and a hardy wear surface between the dual keels make THRIVE ideal for demanding users. Specs: Sizes: 22-31cm (Sandal toe option available sizes 22-28cm) User Weight Rating: 365 lbs. 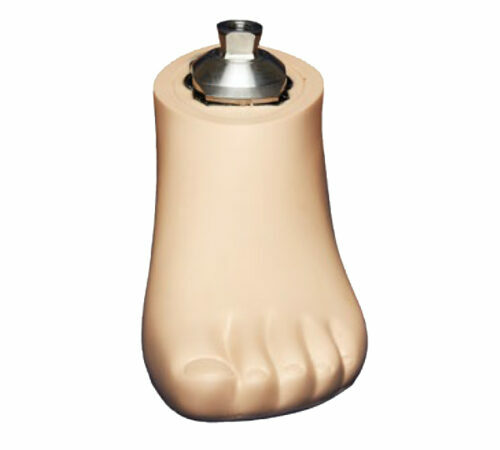 (166kg) Stiffness Categories: 1-9 Connector: Male pyramid Heel Height: 3/8″ (10mm) Part Number: FS5 Warranty: 36 months This foot is eligible for a trial period - please contact us for more information about trials. Specs: Sizes: 22-31cm User Weight Rating: 300 lbs. 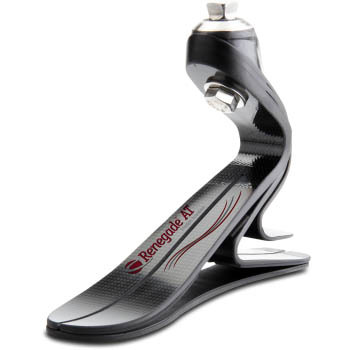 (136kg) Stiffness Categories: 1-6, low and moderate impact Build Height (average): 4.5 inches Connector: Integral male pyramid Heel Height: 3/8″ (10 mm) Warranty: 24 months This foot is eligible for a trial period - please contact us for more information about trials. Specs: Sizes: 22-31cm (Sandal toe option available 22-28cm) User Weight Rating: 365 lbs. 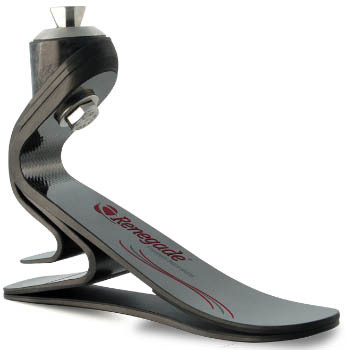 (166kg) Stiffness Categories: 1-9 Build Height (average): 3.7 inches Product Weight (average): 310g Connector: Integral male pyramid Heel Height: 3/8″ (10 mm) Warranty: 36 months This foot is eligible for a trial period - please contact us for more information about trials. 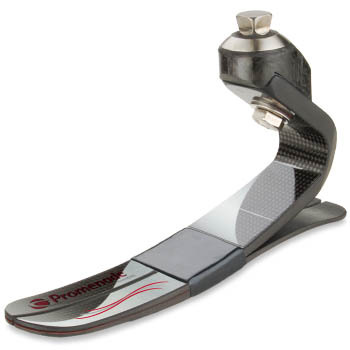 Near Effortless The Promenade™ is engineered to manage the unique gait dynamics of low impact ambulators including the diabetic & vascular amputee population. With an easily deflected toe – not too hard or too soft – the product returns energy without overpowering the less mobile amputee. Users will enjoy a more natural and efficient stride, allowing them to increase their daily activity. 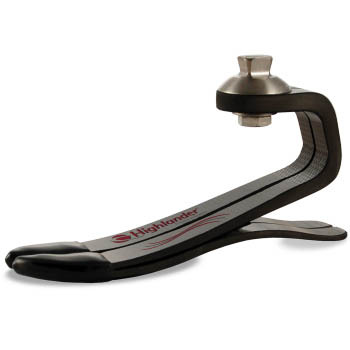 Overview: Near Effortless Roll-Over Optimized For Low Impact Amputees A dynamic heel and easily deflected toe provide near effortless roll-over, helping to reduce gait deviations often presented by low impact ambulators. As a result, the amputee saves energy so they can do more and feel better at the end of the day. 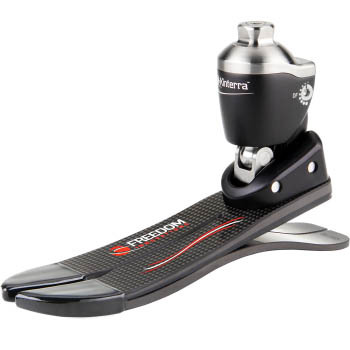 Partial Split Toe The split toe design offers controlled inversion/eversion for stability on uneven surfaces. Users will gain the confidence needed for a variety of walking conditions. Full Length Sole Plate The full length carbon sole plate provides increased energy storage and return and a stable base of support, promoting confidence among users. 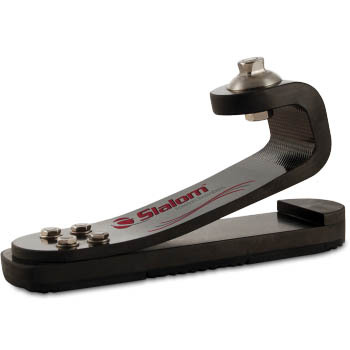 A high strength wrap attaches the sole plate to the foot module, eliminating the stress points and ‘dead spots’ associated with bolted, heel only products. Users experience an uninterrupted, continuously smooth roll-over and increased comfort throughout their daily activities. Simplified Fitting Process As integral male pyramid and just 5 weight categories form which to choose make for an easy fitting process, saving you time and money so you can move on to what’s next. High User Weight Rating The robust, 325 lb. user weight rating makes the Promenade appropriate for a broader range of users compared to competitive alternatives. Warranty and Trial Period A 36 month warranty and 60 day trial period protect your investment and provide peace of mind over the duration of the product’s life. Specs: Sizes: 19-31cm User Weight Rating: 325 lbs. (147 kg) Heel Height: 3/8″ (10 mm) Connector: Male pyramid Stiffness Categories: 1-5 Warranty: 36 months Foot Shell Warranty: 6 months This foot is eligible for a trial period - please contact us for more information about trials. Specs: Range of Ankle Motion: 12 degrees Sizes: 22-31cm (Sandal toe option available sizes 22-28cm) Build Height (averages): 120mm (4.3″), 25cm User Weight Rating: 275 lbs. (125kg) Product Weight (averages): 795g (25cm including foot shell) Stiffness Categories: 7 (low & moderate impact) Heel Height:3/8″ (10 mm) Warranty: 36-months (shell 6 months) This foot is eligible for a trial period - please contact us for more information about trials.